JK Rowling says she has not ruled out an eighth Harry Potter novel, although she is unlikely to consider writing it for another 10 years. Rowling is a runner-up in Time's Person of the Year list 2007. The winner is Russian President Vladimir Putin. The seventh - and apparently final - instalment of the Harry Potter series was published earlier this year. The seventh instalment - Harry Potter and the Deathly Hallows - became the fastest-selling book when it was published in July, based on sales in the UK and US. A handwritten copy of Rowling's new book The Tales of Beedle the Bard recently sold for almost £2m. 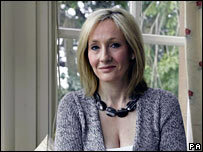 Rowling wrote and illustrated seven copies of the book, which will never be published, but offered only one for sale. The collection of fairy tales is mentioned in Harry Potter and the Deathly Hallows. Proceeds from the sale went to Rowling's charity Children's Voice.